The canvas created a stir on social media after it was spotted during a "60 Minutes" interview with the president. The image created a stir on social media after it was spotted on a wall in the White House during a "60 Minutes" interview with Trump that aired Sunday night. In an interview with NBC News on Monday, Thomas said he was shocked to see his work in the White House. 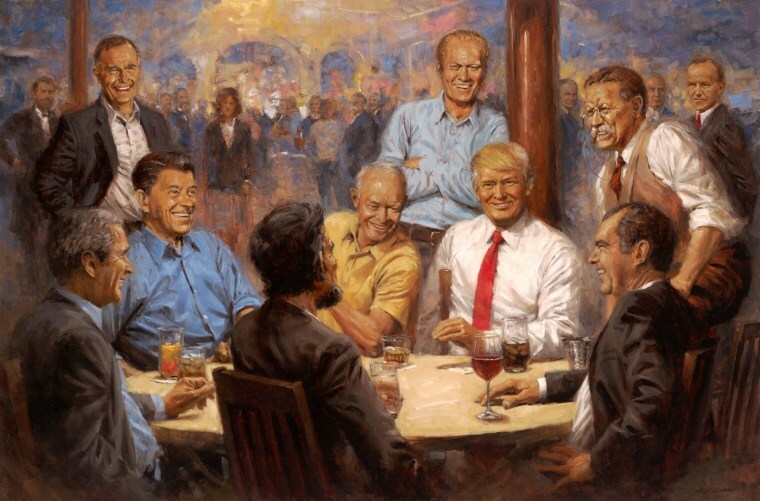 In the painting, Trump is seen hobnobbing over drinks with past presidents of the Grand Old Party: Lincoln; both Bushes; Nixon; Teddy Roosevelt; Dwight Eisenhower; Gerald Ford and Ronald Reagan. The painting is part of a series Thomas created that reimagines historical figures socializing in various contexts. In 2008, he painted a picture pf past Republican presidents playing poker and another of them playing pool. He has also painted Democratic presidents playing poker and pool. Reprints range from $155 to $1,700, depending on size and other factors. The artist is still in possession of the original. Thomas said he's not a member of any political party, has libertarian views and has most often voted for Republicans. The artist told NBC News the presidents in "The Republican Club" are "story-telling" and Lincoln and Trump, in particular, are the storytellers. The background also has familiar faces of other Republican presidents, such as William Taft, in the club, and Thomas said all the remaining GOP presidents are included in the background. There is also a shadowy figure of a woman approaching Trump's table. Thomas said she's intended as a message he has placed in paintings depicting both Republican and Democratic presidents that a woman will be a president one day. "Well, sure, a woman will walk up to take their place," he said. Thomas said Rep. Darrell Issa, R-Calif., who commissioned a self-portrait from him, gave a reproduction of "The Republican Club" to Trump. Thomas said Trump called him a few weeks ago to praise the painting.